Beautiful photo of downtown Portland, Oregon in early Fall. Portland, Oregon offers some of the best fall colors, weather and temperatures on the planet and if you don’t believe me, check the local weather and you will see that the first week of October offers clear and sunny skies with temperatures reaching the high 70’s to low 80’s. You can almost guarantee some of the best fall weather anywhere in the Pacific Northwest. The awesome fall colors are just an added bonus but also offers visitors some of the most spectacular colors on the planet. I’m beginning to believe that the term “Indian Summer” was started in the Pacific Northwest since we experience that exact type of season perfectly. We experience early frost in the morning with cool temperatures that can dip down into the high 30’s to low 40’s. The morning’s can sometimes be a little foggy but by afternoon, the temperatures reach well into the 70’s with nothing but blue skies overhead. Almost anywhere in the Pacific Northwest offers the same Indian Summer season during September and October. Again, the fall foliage is an added bonus and it can hold it’s own to almost anywhere on the planet. It’s also nice to know that you can have a massive waterfall, river or snow capped mountain as your backdrop. One of the great things about visiting Portland, Oregon during this season, is that the tourists are gone and the days are perfect. There are still several festivals celebrating the fall season and you can get a much cheaper hotel as well as avoid the massive crowds at the best drinking holes and eating establishments. The Willamette Valley also boasts some of the world’s best wineries and wines. You are only a few miles from many of the best wineries, near downtown Portland, and I would recommend that you take advantage of them since the harvest season is at the same time. Forest Park in Portland, Oregon! One of the most epic places to visit when visiting Portland, Oregon is Forest Park. There are over 5,100 acres of forested trails with over 70 miles of hiking terrain. Most of the trees are second growth with a few patches of old growth. 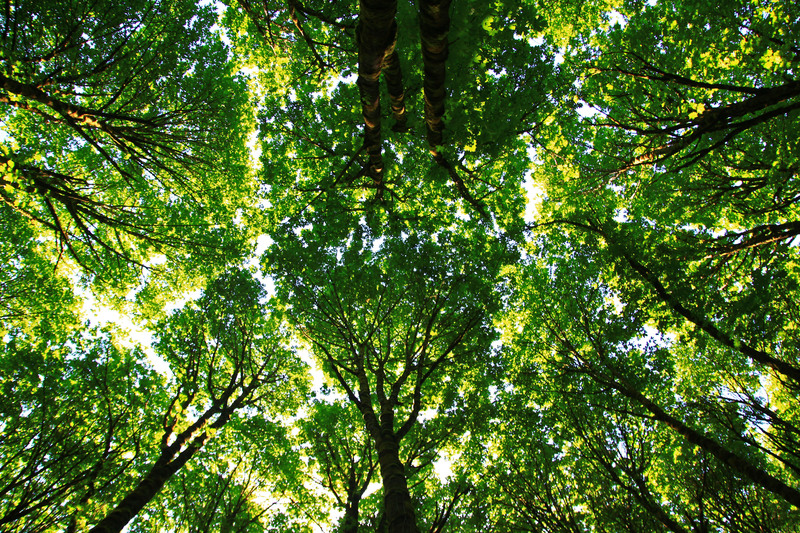 However, compared to other city’s forests’s, you may as well call Forest Park the largest forest in America. There are over 100 species of birds and over 60 mammals that call Forest Park home. If you really want to take advantage of the incredible vegetation I would recommend that you visit between May and June. May is great since you’re able to see wild flowers, such as iris and trillium but June is the best month to witness the park in a complete canopy of neon green vegetation. It almost takes on the effect of a tropical forest. There are millions of ferns and several creeks that cut through the forest as well as several small wooden bridges that carry hikers over the sometimes muddy creeks. Most of the trails are fairly easy to hike but if you’re interested in getting a good workout, you can easily find parts of the trail that have steeper inclines and cover more elevation gain. If you’re interested in mt. biking, you will be glad to find out that there are over 30 miles dedicated to bikers. Most of the trails are pretty steep, so you will have to be in pretty good shape if you expect to climb some of the challenging and sometimes muddy trails. However, a good part of the biking trails are on the old road that traverses the park but the city has done a good job of doing some maintenance work in order to make it more of a wilderness trail. There are several areas where you can start from and if you’re driving to the trail there are several parking areas where you can find the best trail. Since the trail is just seconds from several Portland neighborhoods, most people just step out of there front door and make a quick trip to the nearest trails. 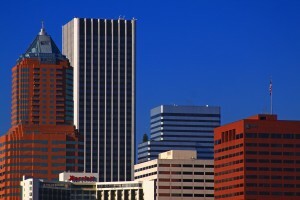 There are several viewing spots that will give you a glimpse of the Portland skyline, views of Mt. Hood, Adams, St. Helens and Rainier. You can also get a glimpse of the st. John’s bridge as well as the train bridge and the Willamette river. 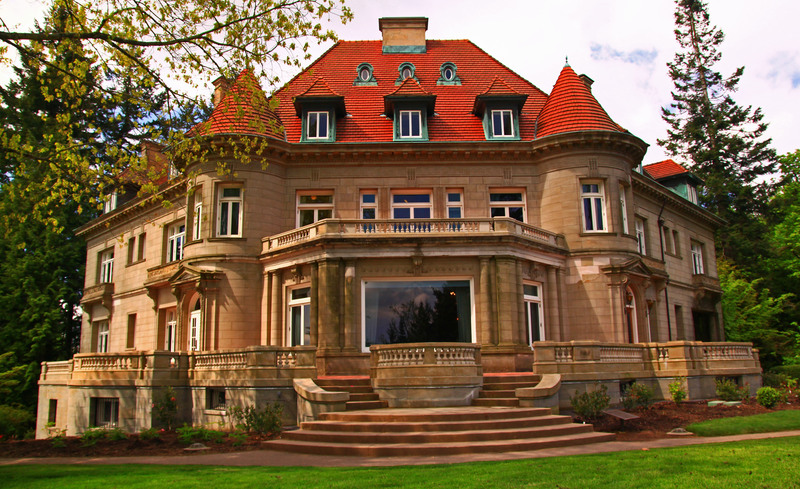 However, the best views are from nearby Pittock mansion. The Collaborative Life Science Building (CLSB) is located on the South Waterfront district and is located in Portland, Oregon. Oregon Health and Science University and the Oregon University System have gotten together to bring a new facility to Portland State students in 2014. It seems like the construction of the building has taken over a decade to construct but considering the sheer size of the building as well as the fact that Portland’s newest bridge is just east of the project and will take pedestrians, buses and light rail directly through the building, it seems like the project has actually gone pretty quickly. The city also constructed an overpass between downtown Portland and smack dab along the South Waterfront and over to the CLSB and then eventually over the new bridge. The CLSB will offer opportunities for students from PSU, OHSU and Oregon State University to study together under one roof as well as trimet operating part of their hub from the building. Buses and light rail will pick up and drop off pedestrians from the building. The CLSB is being built on 19 acres of land that was donated by the Schnitzer family. Undergraduate students will be studying alongside scientists who will be conducting cutting-edge research. There will be over 185,000 square feet of education space as well as a 400 seat lecture hall. 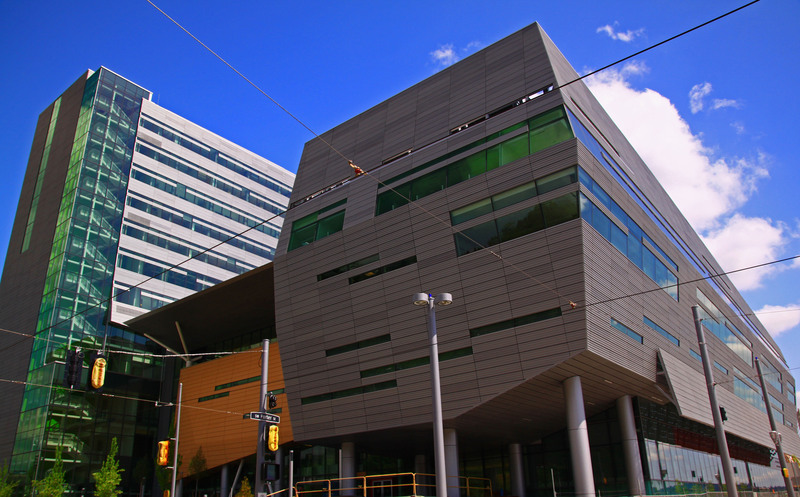 Other portions of the building, such as OHSU’s School of Dentistry will also be located in the building. The building will also be LEED certified and offer storm water management, ecoroofs and atrium heat recovery. The building will also offer hundreds of bike storing stations, which will make it more accessible for students and bike commuters. The entire stretch between the South Waterfront and downtown Portland is very pedestrian friendly and there has been a tremendous amount of money spent on constructing lots of pedestrian access throughout the entire area. The new bridge that is being constructed over the Willamette river and is only a few hundred feet from CLSB was recently named Tilikum Crossing and it will be getting plenty of traffic once it’s completed. The entire area surrounding the bridge and the CLSB is just about to explode with new pedestrian lanes, river access and other construction projects. 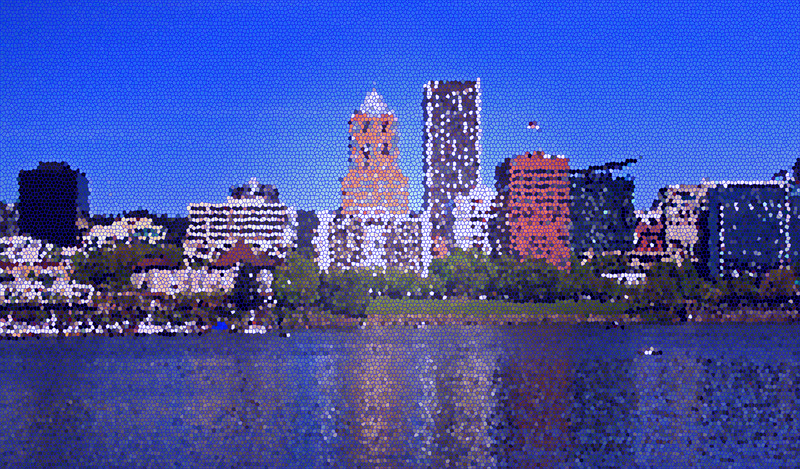 Portland, Oregon isn’t considered one of the biggest metropolitan cities in the United Sates, so it can make it very difficult to photograph the city in a way that allows someone to see Portland as a large metropolitan city. Most photographers can utilize their talent and trickery to make something look bigger or even more stupendous that it really is. Hotels are a good example since they will hire a photographer to take photos of their property outside and only take photos that will give potential visitors the perception that it’s located in an ideal location or that their property is more stellar that it really is. Unfortunately, once they arrive at the property, they are surprised that the hotel is less than desirable. However, you can’t blame the photographer since they only took photos that didn’t include any of the undesirable buildings or other obstructions that make the hotel less than desirable. This brings me to the fact that photographing an entire city can be very frustrating and difficult. 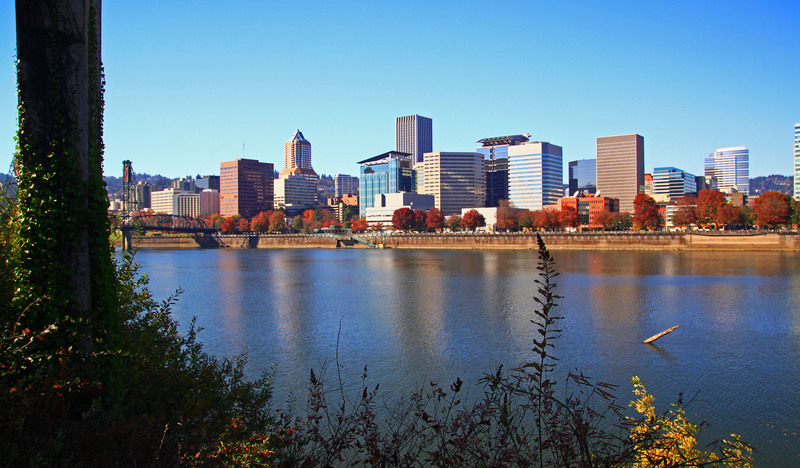 Portland, Oregon is no exception since it is mostly regarding as a very large town with some tall buildings dotting the cities landscape. Actually, it is a pretty descent sized city but it’s high rises are located in several different parts of the metropolitan area. If you have looked at any of my other photos that I’ve posted on my blog, you have noticed that I’ve chosen several different locations to photograph the city. This causes you to only see a very small part of the buildings due to the fact that the city is very spread out. However, I did want to post the photo on this article to show how you can only include a cluster of building in order to give the impression that Portland is much bigger than it really is. I chose a day when there weren’t any clouds and the skies were perfectly blue. I also made sure that there weren’t too many shadows being cast from the buildings. This allows one to see only the cluster of buildings, rather than dark shadows hiding the subjects. Unfortunately, I wasn’t able to eliminate the bare trees in the foreground of the city scape. I was hoping to crop them out but then I would have had to also crop out parts of the buildings. Too get this shot, I made sure to attach my telephoto lens and zoomed in enough to capture the buildings on both sides and made sure that there wasn’t any bare or open spots on either side. Again, this gives the allusion that the buildings are never ending. 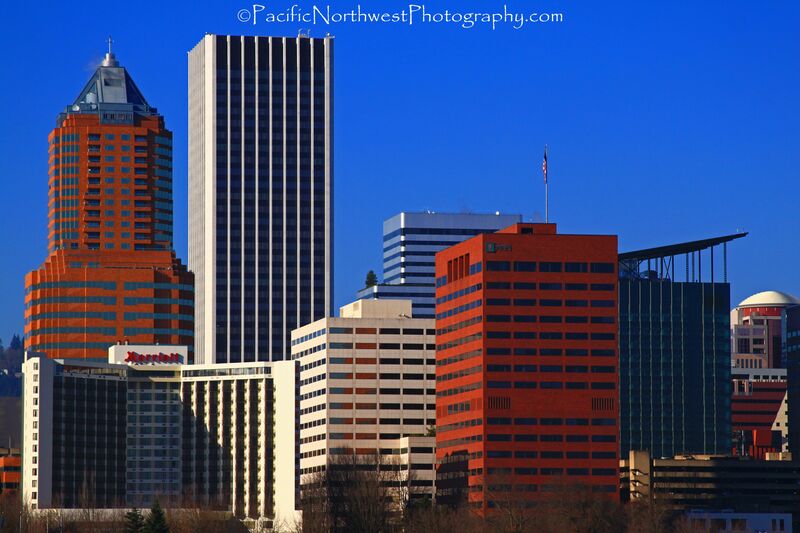 Here is another photo of the city skyline of Portland, Oregon. It’s very similar to my most previous post but I included this photo to show the contrast between looking due east and north east. This photo was taken while shooting north east. The best part about this view is that you can see almost all of the downtown building but unfortunately you aren’t able to see any of the snow capped mountains. Mt. 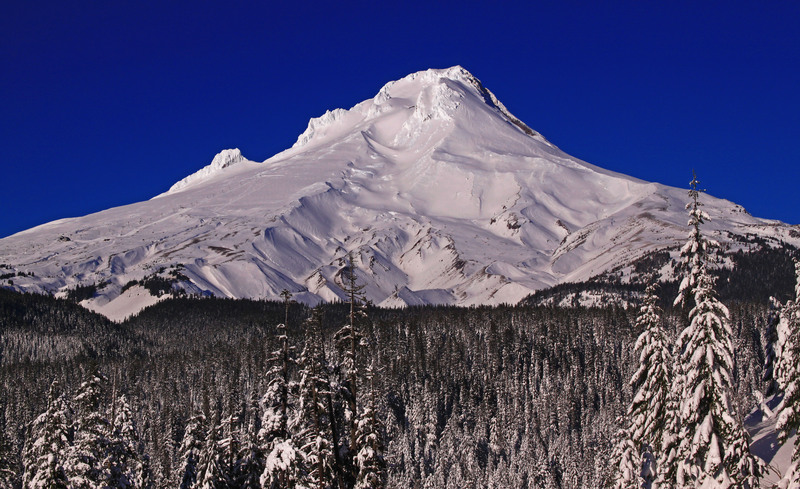 Hood is just to the right of the KOIN tower and Mt. Adams is just to the left of Big Pink. Mt. St. Helen’s and Mt. Rainier are pretty far out of the picture. This photo and the last are pretty common sights during the last few days of November or early parts of December. The days are mostly sunny with little to no clouds but the temperatures can become bitter cold with an even colder wind chill. You can see that there isn’t any snow along the foothills of the Cascades and there is still some vegetation on the trees. Cold and sunny early winter days offer some of the best days to photograph the city but unfortunately the lack of green vegetation can really hamper it’s effect. To get this shot I was using my Canon T1i and attached my Canon 28-135mm lens. I had the camera mode in Normal so the shutter speed was at 1/128 second. I opened the zoom at 28mm and had the ISO at 100. I also had the aperture at F-7.1 and reduced the white balance to -0.3 due to the bright sunlight. I also attached my CIR-PL and warming filter to adjust for the sunlight and take advantage of the warm light.